In terms of sound, UNIPOD delivers an immersive audio and punchy bass. This product with Neodymium technology produce a great synchronised sound fit for all music tastes. 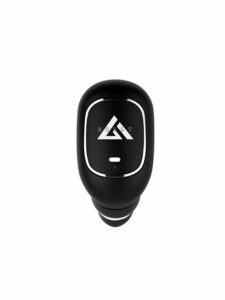 Due to the ergonomically designed shape it naturally fits the contours for a firm instinctive fit and the sound travels straight to the ear canals and delivers high fidelity audio to let the user enjoy music fully. UNIPOD’s ear tip angled at 45 degrees that fits into the ear canal perfectly, preventing it from falling off, and makes it extremely comfortable to wear for long calls & musical sessions. UNIPOD is made for the true audiophiles who are looking to get past the traditional wires and headphones. UNIPOD features a condenser microphone and a multi function power button to control music and calls. It also features a multi-function button to answer/reject calls, play/pause/fwd music. It also allows the user to take voice notes on the go and use Siri/ google assistance voice activation. The UNIPOD can last upto 6 hours of talktime, or more than a day on standby. Feel free to move around without worries of repeated charging. 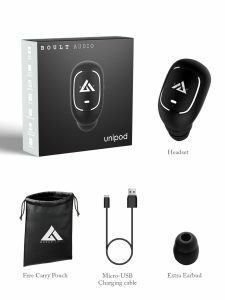 UNIPOD features Bluetooth 4.2 Technology to ensure fast and seamless transmission of music and calls to ensure you have a seamless & smooth experience. UNIPOD works with all Operating Systems: iOs, Android, Windows, Blackberry & others. It also works with ALL Bluetooth enables devices: Smartphones, Laptops, Bluetooth enabled PCs, Tablets, Smart TVs.